For years, Amahl was presented live, but in 1963 it was videotaped by NBC with conductor Herbert Grossman and an all-new cast featuring Kurt Yaghjian as Amahl, Martha King as The Mother, and John McCollum, Willis Patterson, and Richard Cross as the Three Kings. When Menotti found out that NBC had scheduled the taping on a date when he was out of the country, he tried to get the date changed. The network refused and recorded the 1963 performance without the composer’s presence or participation. This version was shown in 1964 and 1965; although a final live version with Kuhlmann and the rest of the original adult cast was also broadcast in 1964. Menotti never approved of the 1963 production, and in May 1966 when the rights to future broadcasts reverted to him, the composer refused to allow it to be shown again. 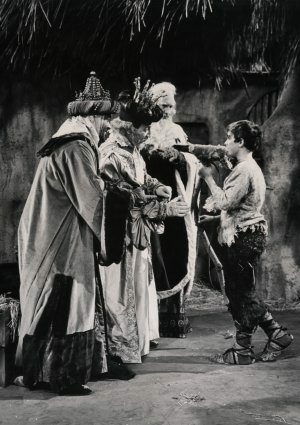 Because of this, Amahl was not shown on television at all between 1966 and 1978. Yes, the 1955 version is available on DVD. Please when was the original Amahl last on tV? and might it ever be on again?